Freecharge refer trick will help you to get unlimited referral bonus from freecharge. Freecharge had started refer and earn few days ago through which one can earn upto Rs 5000 worth FC credits which can be used for shopping or recharge transactions. You can take either your freecharge go master card and use out for shopping or can do your recharge transactions easily on freecharge (Check this post to get the latest freecharge coupons and cashback offers). In the Similar manner Snapdeal had also introduced the refer and earn program (Rs 100 FC Credits per referrals up to Rs 2500). You can add up the both referral bonuses and get upto Rs 7500 worth FC credits per freecharge account. 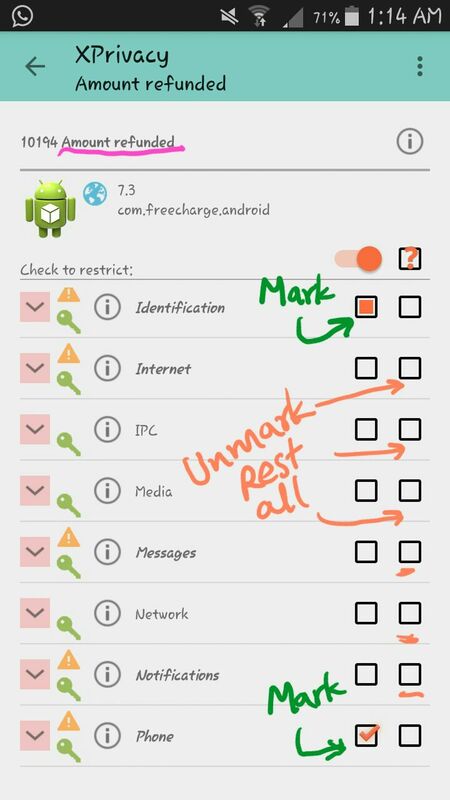 You can enjoy this loot with Freecharge refer and earn trick.Earn unlimited free recharge by becoming Freecharge New Users every time.Use same device multiple time to loot freecharge referral program.New number, new debit card, rooted device is must to grab the trick.Just follow the procedure below and enjoy the loot. You can also use it on Bluestacks but we had not verified the same. Modded Freecharge.apk is incomplete So showing name as amount refunded But working fine. 1. Install Freecharge Mod And open Xprivacy go To FreeCharge (amount refunded) Setting Inside. 5) Now Open Root Uninstaller and find Freecharge (amount refunded) and click on it. A new setting panel will Open. Here Click FREEZE>RESET>DEFROST>RESET in a sequence. 6) Now open FreeCharge Mod And Register a New Account. Proceed a recharge of Minimum Rs 20 By Using Code ###### AND it will be applied..
26 Responses to "Freecharge Refer Trick to Earn Unlimited Free Recharge"
Please bro update its solution. It shows maximum redemption reached on 2nd time … please update asp because i have many freecharge ids all have got RB5050 offer. From 1 id it have been redeemed successfully but 2nd time from 2nd id it says “maximum……….. ……”.. please bro update how i can redeem all ids coupons from 1 device..
Admin refer and earn is not valid on virtual card…code apply karne ke baad de raha hain…any bypass idea ??? freecharge go master virtual debit card can’t used. We will find the solution of the same. my fon is properly rooted! Option will Come. simply download Root Uninstaller Pro Version From Above link. First install Freecharge Mod .apk After that U will find an app “amount Refunded” on Xprivacy and RootUninstaller pro app G.L.